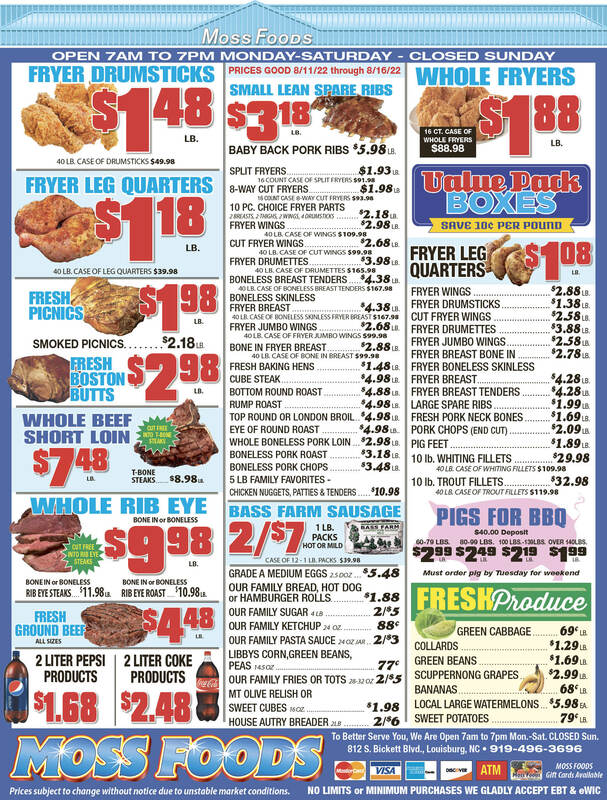 Showing 40 articles from March 4, 2015. 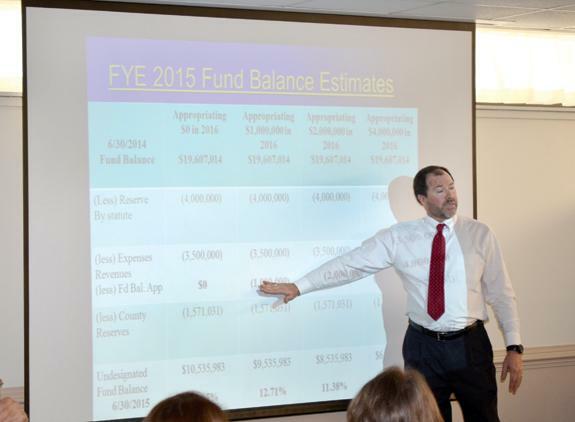 LOUISBURG -- If the county wants to sustain its current level of service and stop relying on its fund balance, commissioners would have to raise the tax rate by just under 9.5 cents per $100 of valuation. They would have to add more than 2 cents at that rate to cover anticipated spending increases in the school system and the sheriff's office. 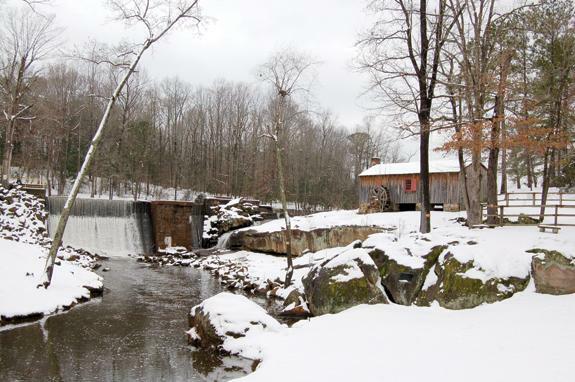 The scene at Perry's Mill Pond (above) looks like it belongs on a calendar or a post card! But whether you're tired of fighting the cold and ice or still enjoying the beautiful, snow-dusted scenery, the first sign of spring arrives this weekend when Daylight Saving Time begins. Don't forget to "spring ahead" an hour Saturday night! LOUISBURG -- A man who was on probation for an unrelated assault was charged with murder last week. Richard Antoine Toney, 25, made an appearance in Franklin County District Court on Tuesday and his case was continued until March 10. 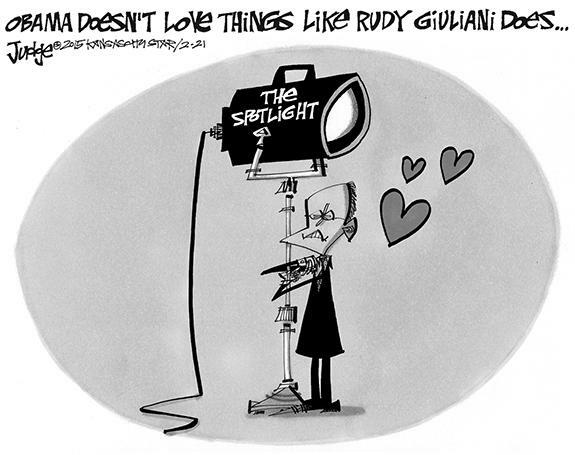 He had yet to be appointed an attorney. LOUISBURG -- Three of the four suspects involved in a home invasion that devolved into a shootout were sentenced to prison last month. The case against the remaining suspect has yet to be scheduled. Twins Devin and Traven Riddick and Quasime Sidney pled guilty in Franklin County Superior Court to their roles in a January 2013 home invasion on Whites Way in Louisburg. BUNN -- In a few weeks, town commissioners hope to be closer to naming a new police chief. Tentatively, the board expects to begin interviewing candidates on March 20. Town officials have been looking for a new, permanent police chief since the end of November when former Chief Kent Winstead resigned his post to take the county's sheriff's position. Okay, that little temper tantrum by Mother Nature last week would have been pretty -- IF -- it had happened the day before Christmas and made Santa's deliveries a little easier. But coming in late February on the heels of other storms and while many of us were longing for spring was just cruel. However, as ace reporter Carey Johnson noted, at least it was a "good" kind of snow -- assuming you agree there can be such a thing. Good news! Franklin County is going on a gold mining expedition. No, not gold of the nugget type that fueled a 19th mining boomlet in the northern part of the county. It's not that kind of gold. What the county -- actually, the county's consultant -- will be looking for are historical treasures that are worth documenting and preserving. 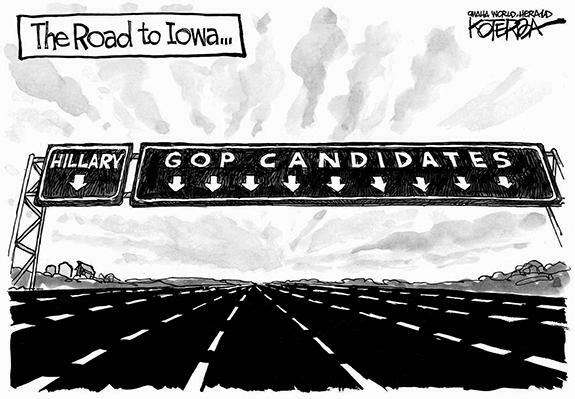 Ah, the information superhighway is full of so many potholes. The one involving former Secretary of State and, perhaps, presidential nominee, Hillary Clinton, is just the latest technological crevice that has dinged many a politico navigating new technology. It was recently revealed that Clinton was using a private email account to conduct official business. 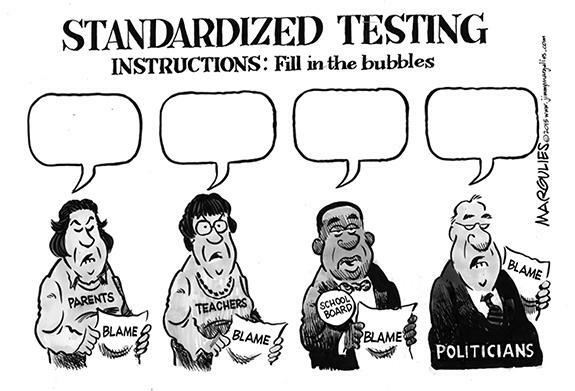 Diverting education money; could the motive be greed? When we try to analyze why an individual does something, we look to what motivates them. It can be a good thing. Why does an athlete train so hard or a student study so diligently? It can be a bad thing. When law enforcement tries to solve a crime, they often start their search by looking for opportunity and motive. NEWPORT NEWS, VA. - Funeral services for Della D. Silver, 75, formerly of Hollister, who died Wednesday, Feb. 25, were held on Wednesday, March 4 at White Rock Baptist Church and was officiated by the Rev. Alonzo West. FRANKLINTON - Funderal services for Dorothy Jones Stanberry, 80, who died Monday, March 2, 2015, will be held at 2 p.m. Monday, March 9 at First United Church of Christ with the Rev. Douglas Wooten officiating. Dr. Bill Palich died peacefully on Feb. 25, 2015 at the age of 83. Born in Spokane, Ohio to Mary Rose Mitrovich and Louis Michael Palich, Bill was raised to value hard work and kindness, which he practiced every day until his death. LOUISBURG - George Warren Marshbourne, Jr., 83, of Louisburg, died Tuesday morning. LOUISBURG - Funeral services for baby girl Kaylena Jarnel Thomas, four months, who died Sunday, March 1, will be held at 3 p.m. Sunday, March 8, at Emmanuel Church of God with the Rev. M.H. Jones officiating. YOUNGSVILLE -- Funeral services for Mary Joe Holden, 87, will be held at 1 p.m. Tuesday, March 10, at Union Grove Baptist Church with burial to follow in the church cemetery. The Rev. Samuel Tunstall will officiate. FRANKLINTON - Paul "Stanley" Coffey, 73, of Franklinton, died on March 2, 2015. He died peacefully, at home, with his devoted wife of 50 years, Linda May Coffey, by his side. Stanley was born May 30, 1941, in Caldwell County and briefly resided in Baltimore, Md. during the mid-1960s. LOUISBURG - Funeral services for Rosa L. "Sweet Rose" Perry, 72, who died Saturday, Feb. 27, will be held at 1 p.m. today, March 5, at St. Stephens Baptist Church with the Bishop Mario Davis officiating. MANASSAS, VA -- Funeral services will be held at 1 p.m. Thursday, March 5, for Valissa L. Hines, 48, who died Thursday, Feb. 26, 2015. Services will be held at Richardson Funeral Home Chapel in Louisburg and burial will follow in the Lynch Cemetery in Hollister, NC. TAINASHA TO THE BUCKET. 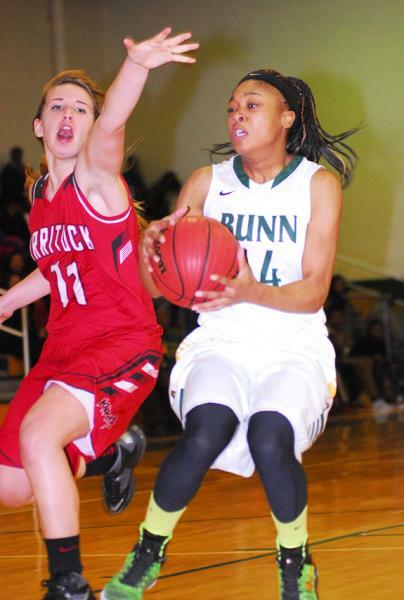 Bunn's Tainasha Vines (with ball) makes a strong move into the paint for the Ladycats during Tuesday's loss to Northside Jacksonville in the third round of the Class 2-A Girls Basketball State Playoffs. 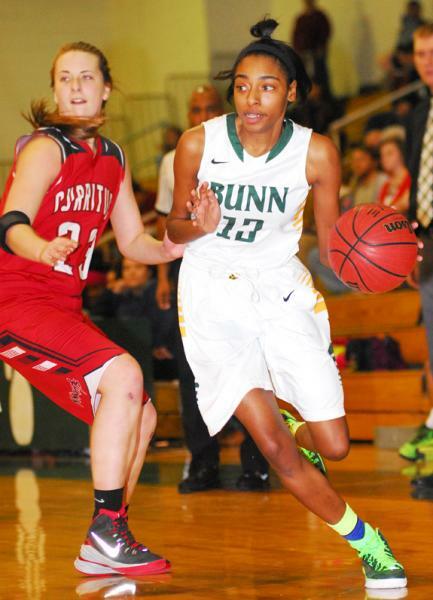 BUNN - One burning question will haunt the Bunn Ladycats for a long, long time -- and it doesn't have a concrete answer. All of BHS' players, coaches and fans will wonder how the Ladycats could have fared in the Class 2-A State Basketball Playoffs if freshman guard Bernadette 'Butterball' Cooke had been available. TATYANA TO THE HOOP. Louisburg's Tatyana Seda (left) drives toward the basket for the Lady Warriors during last Saturday's decision over Kestrel Heights in the Class 1-A State Girls Hoops Playoffs. LOUISBURG -- Ten games in, Louisburg High School first-year girls basketball coach Mike Sheldon probably would have laughed at the suggestion that his club would win the Tar-Roanoke Athletic Conference championship and advance into the Class 1-A State Playoffs -- and even earn a postseason victory. Louisburg was 1-9 at the time and coming off a tough stretch against a quality non-conference schedule. DESHAWN GETS DEFENSIVE. Louisburg College's Deshawn High (right) clamps down defensively for the Hurricanes during Sunday's victory over Vance-Granville Community College at the Region X Men's Basketball Tournament. 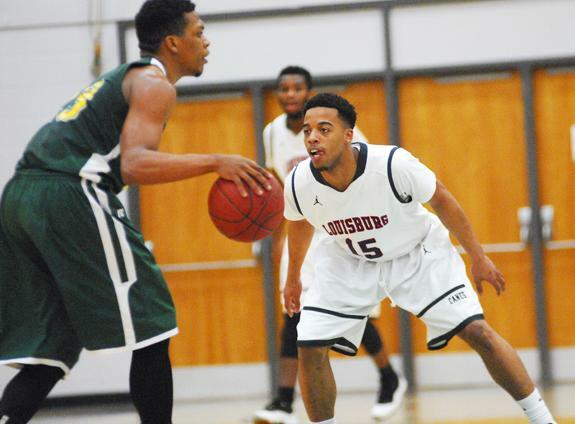 PETERSBURG, VA. -- Seven minutes does not a champion make -- and that's a point Louisburg College coach Mark Vanderslice is accentuating to his team heading into the final two rounds of the Region X Men's Basketball Tournament. 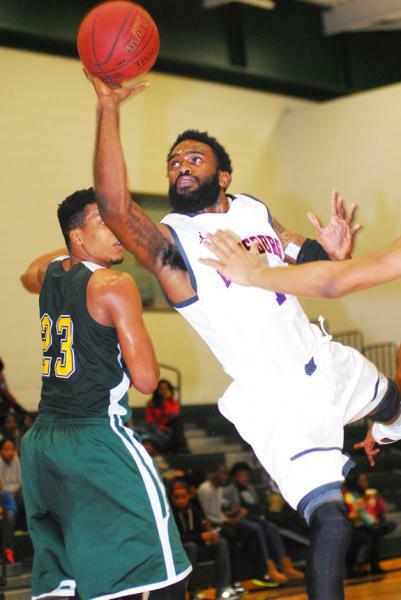 During last Sunday's opening-round event against backyard rival Vance-Granville CC, the Hurricanes erupted and played some of their best basketball of the campaign over the initial seven-minute stretch. GOODS JOB. 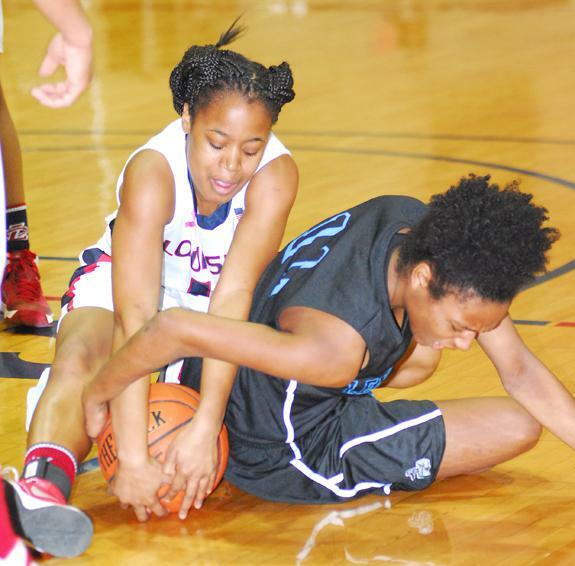 Louisburg College's Deneysha Goods (left) tries to claim a loose ball during last Friday's home hoops triumph versus Lenoir CC. LOUISBURG -- Louisburg College closed out the women's basketball regular season with five victories in a row, including a 26-point drubbing of Lenoir Community College in last Friday's home finale at the Taylor Center. But while LC coach Shay Hayes thinks the late surge can help the Lady Hurricanes build some momentum, she considers the successful stretch to be inconsequential once the ball is thrown up today for the opening round of the Region X Tournament. GALLATIN SAYS GOODBYE. Bunn's Keira Gallatin (right) heads toward the basket during the Ladycats' home basketball playoff victory Monday night against Currituck High School. BUNN -- Currituck scored the first two points -- and never led again -- during Monday's matchup with homestanding Bunn in the second round of the Class 2-A Girls Basketball State Playoffs. 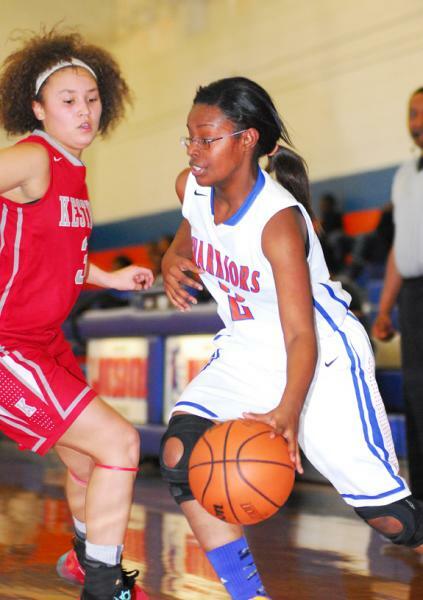 The Ladycats were sharp from the beginning, using their full-court pressure defense to take charge early. With its margin secured, BHS would go on to earn a convincing 68-32 triumph over the Knights at the Bunn Dome. LOUISBURG -- Louisburg College will serve as the host for this weekend's Region X Division I and II Basketball Tournaments at the Taylor Center. The Division II event is down to the semifinal rounds and will feature the top-seeded and host Hurricanes in action against Pitt Community College on Friday at noon. LOUISBURG -- Louisburg High School will host a Warrior Pride 5-K Scholarship Run on April 18 on the LHS campus. Entry fee is $25 per person. Anyone who registers by April 1 will receive a free T-shirt. There will be a 5-K competitive run and a 5-K recreational run/walk. LOUISBURG -- Louisburg High School's boys tennis team began its 2015 season on Tuesday with a 7-0 sweep against Kerr-Vance Academy. LHS, coached by Johnathan Waugh, delivered four singles victories and earned two more via forfeits. 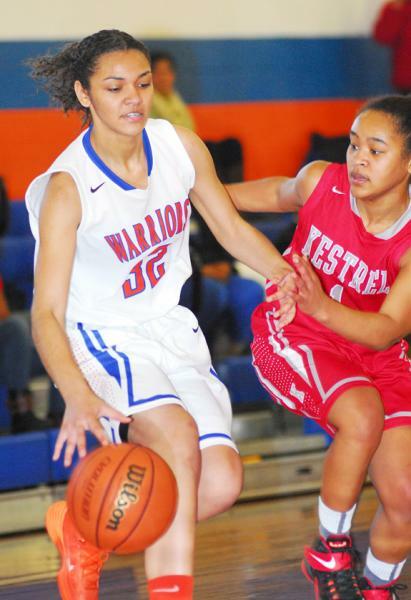 The Warriors returned to the court on Wednesday with a road matchup against Roxboro Person. 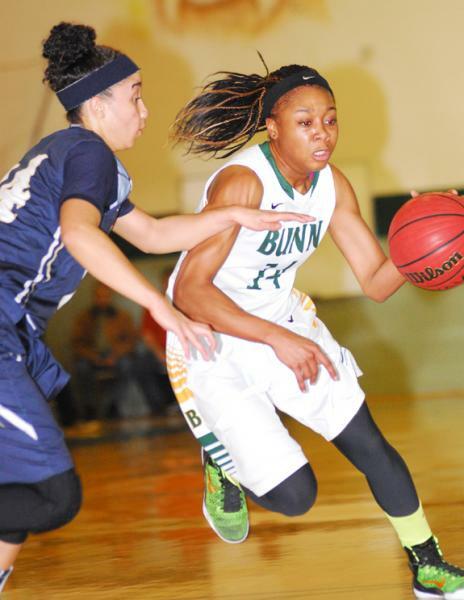 Bunn High's Precious Walker locates an open teammate during Monday's home playoff triumph. 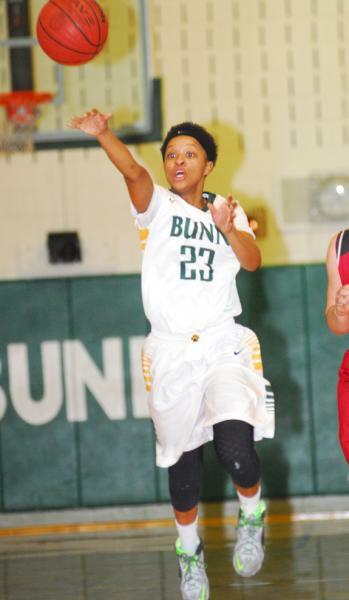 Bunn High School senior Tainasha Vines (right) drives for two more points for the Ladycats during the Ladycats' home playoff victory Monday evening against Currituck County. 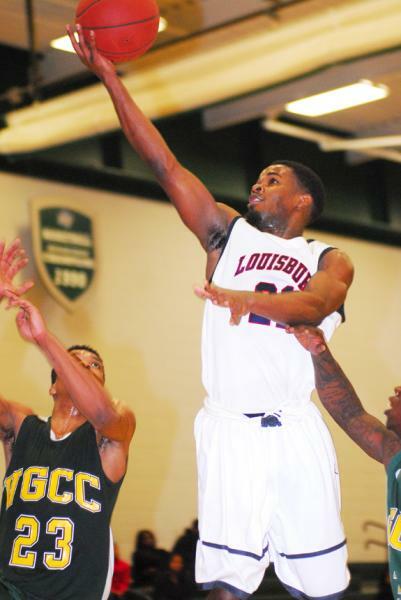 Louisburg College guard T.J. Wilson floats for a bucket against Vance-Granville CC. Louisburg's Tyreka Kearney drives toward the basket last Saturday afternoon against Kestrel Heights in the opening round of the Class 1-A Girls Hoops State Playoffs. 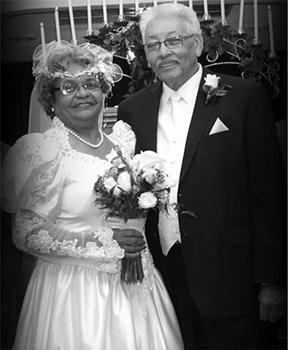 James and Martha Collins celebrated their 50th Wedding Anniversary by renewing their vows at 1 p.m. Saturday, Nov. 29, 2014, at Hickory Grove Baptist Church in Castalia. Pastor Bobby C. Thomas officiated the ceremony. A reception followed the ceremony at the Louisburg Police Operations Center. The bride was given in marriage by the couple's two daughters, Valerie C. Harris and Shelia M. Collins, both of Louisburg. Wish away the snow, ice, sleet and begin thinking of spring because one of the first tangible signs of that much gentler season will happen on Saturday, March 21. That's the day the Franklin County Extension Service will hold its annual tree gtive-away in celebration of Arbor Day. 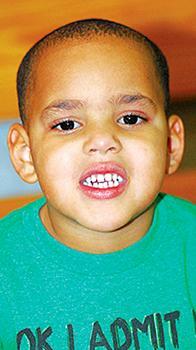 The event will begin at 9 a.m. sharp at the Farmers Market in Shannon Village Shopping Center. Both of those ideas are expected to be bandied about during the parks and recreation advisory board's March 12 meeting. The First Flag #852 Children of the Confederacy, Joseph J. Davis #537 UDC and Franklin Rifles #310 SCV are holding the 154th Anniversary flying of the First Flag ceremony at the Franklin County Courthouse in Louisburg on Sunday, March 15, at 2 p.m. It will also be the 25th Annual Flag Memorial Service and Wreath Laying Service. Special guests will be Popular Grays SCV #1700 and other UDC Chapters. LOUISBURG -- Franklin County sheriff's deputies are investigating a shooting at a night spot between Louisburg and Bunn. 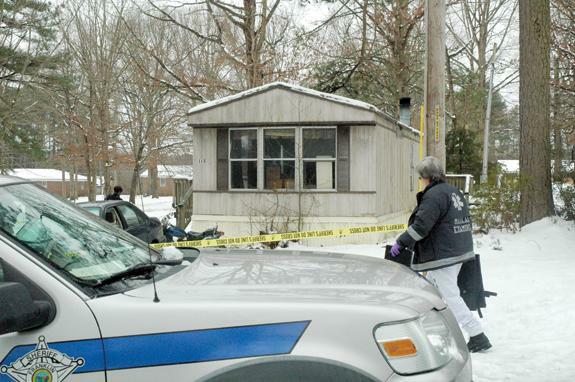 The morning of Feb. 28, deputies responded to the Flat Top bar on N.C. 98 to find a 50-year-old man suffering from a gunshot wound to the leg. Friends, investigators said, took Michael L. Brown to WakeMed where he was treated for non life-threatening injuries.